Topoisomerase inhibitors are effective for antibacterial and anticancer therapy because they can lead to the accumulation of the intermediate DNA cleavage complex formed by the topoisomerase enzymes, which trigger cell death. Here we report the application of a novel enzyme-based high-throughput screening assay to identify natural product extracts that can lead to increased accumulation of the DNA cleavage complex formed by recombinant Yersinia pestistopoisomerase I as part of a larger effort to identify new antibacterial compounds. Further characterization and fractionation of the screening positives from the primary assay led to the discovery of a depside, anziaic acid, from the lichen Hypotrachyna sp. 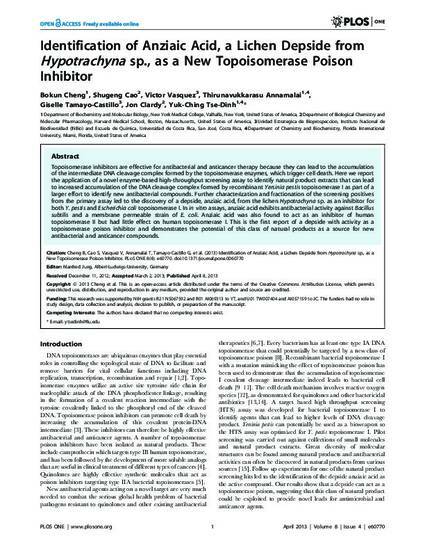 as an inhibitor for both Y. pestis and Escherichia colitopoisomerase I. In in vitro assays, anziaic acid exhibits antibacterial activity against Bacillus subtilis and a membrane permeable strain of E. coli. Anziaic acid was also found to act as an inhibitor of human topoisomerase II but had little effect on human topoisomerase I. This is the first report of a depside with activity as a topoisomerase poison inhibitor and demonstrates the potential of this class of natural products as a source for new antibacterial and anticancer compounds.